A Cobalt Blue/Teal patterned delicate silver plated link bracelet. It's made of 14 small round pieces of Dichroic glass. It measures 19cm including the catch. Each of the links is 0.7cm in diameter and there are 14 small pieces of dichroic glass on the delicate silver plated bracelet. Each piece is approx 0.8cm and is made of two layers of glass. 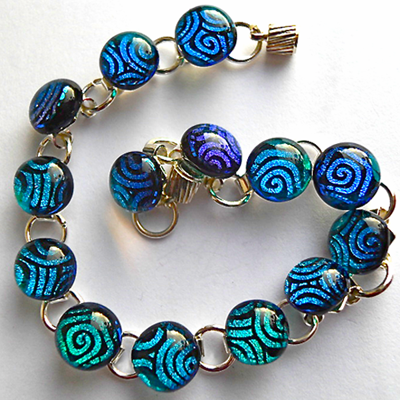 A Teal/Blue patterned Dichroic layer and a clear glass layer fused together. The magnetic catch makes it much easier to put on and take off the bracelet. It comes in a bracelet gift box.